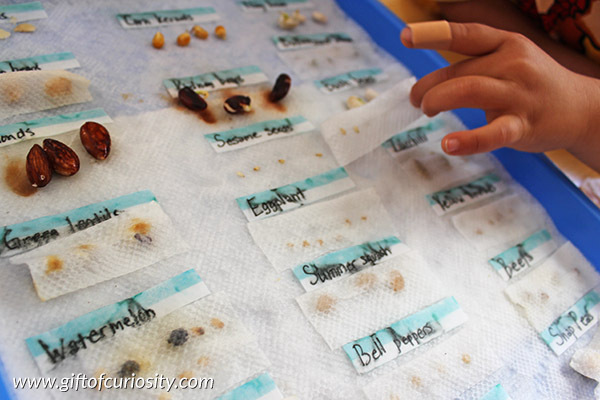 Last spring my kids and I spent several weeks learning about seeds. 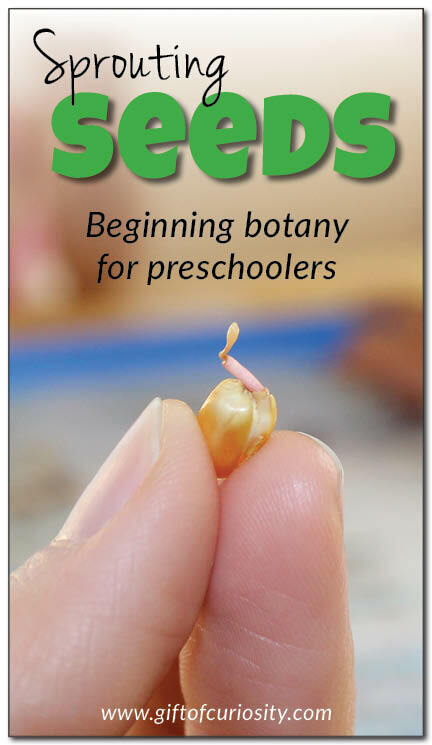 This is the fourth of several planned posts sharing all of the wonderful ways we learned about seeds during our preschool seed unit. 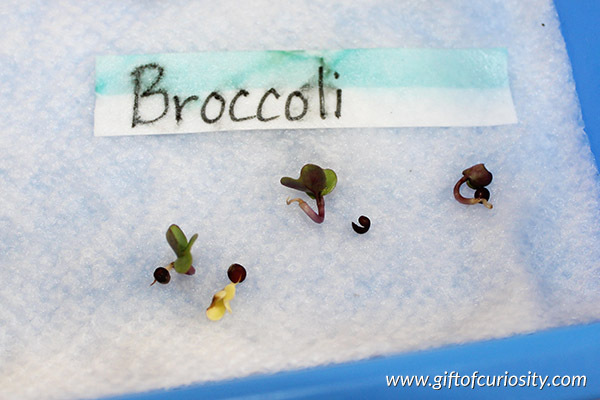 In this post I’m focusing on a seed sprouting activity we did to explore how seeds work and to observe the great variety in the leaves that shoot out of them when they sprout. 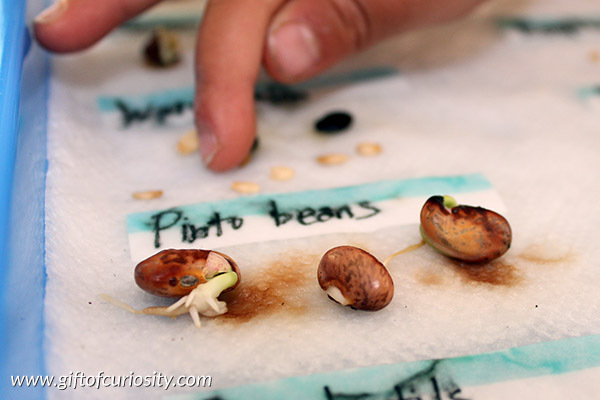 Sprouting seeds with my kids was a real highlight of our seed unit. It is so simple to do and kids just love it! 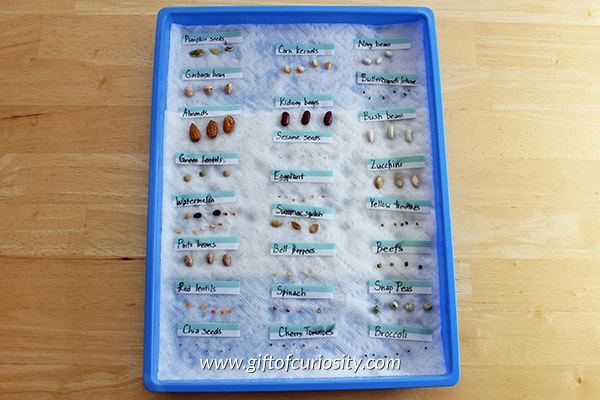 Although it would be fine to sprout just one or two different kinds of seeds, we decided to go BIG for this activity. 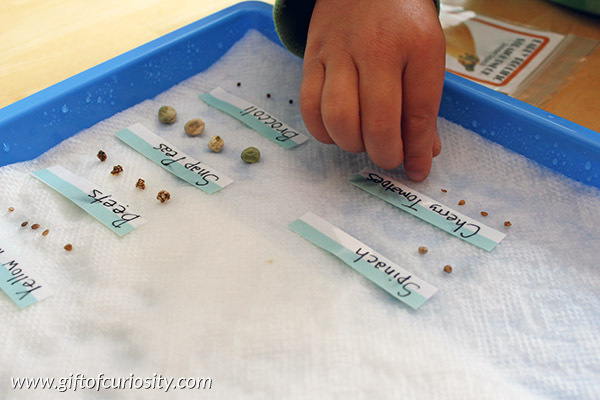 We used 24 different types of seeds for our seed sprouting activity, and it was AWESOME! Half of the seeds we used were ones I had purchased to do some initial explorations with seeds. The other half were mostly seeds we already had in our kitchen, including red lentils, garbanzo beans, pumpkin seeds, and pinto beans. Some seeds were collected from fruit we ate, such as the watermelon seeds. 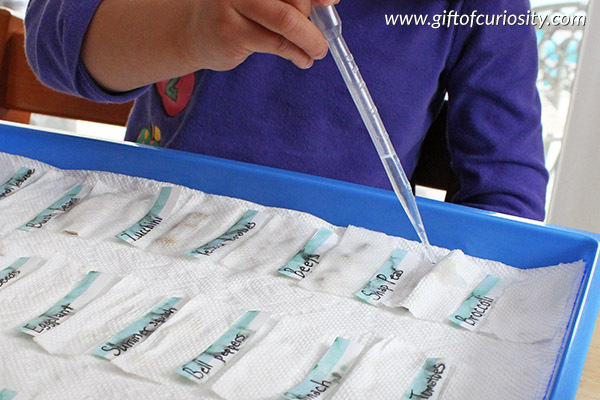 We laid all the seeds out in nice little rows so we could keep track of how they sprouted. After 7 days, we decided to take a peek at our seeds to see how they were doing. We carefully lifted the strips of paper towel to see what was happening underneath. Not all of the seeds had sprouted yet, but we oohed and aahed over the ones that had. We enjoyed the tiny leaves that had started to form. And mostly, we basked in the wonder that is nature, marveling at how a tiny little seed manages to grow into so many different plants, flowers, trees, and foods. Thanks for this wonderful project. I have looking for this project for a long time ago. I will sharing this project for indonesian kids. They will love it.